Clarity Media Group, owner of Colorado Politics, is expanding the pub's reach. The weekly will cover politics, policy issues and elections in the city and county of Denver, in a new section called "Focus on Denver," beginning with the March 30 issue. “The move aims to better meet the needs of its significant readership residing in the Denver metro area,” the company stated. Neil Westergaard, former editor of the Denver Business Journal and The Denver Post, will contribute a regular column on the city for Colorado Politics. John C. Ensslin, a former Rocky Mountain News journalist, will cover Denver politics, government and civic affairs. 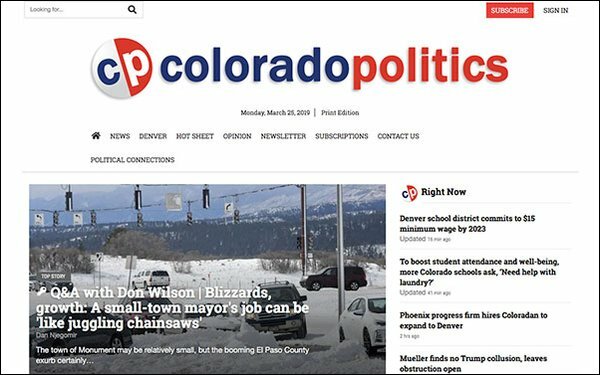 "At Colorado Politics, our mission has been to provide award-winning coverage of state politics and policy, and that will continue. But in today's challenged media environment, our readers are in desperate need of in-depth, insightful reporting on the city of Denver, its government, its politics and its issues," stated Mark Harden, managing editor, Colorado Politics. A new Denver section will also be added to ColoradoPolitics.com, and Denver news will be featured in enewsletters twice each weekday. Clarity Media Group owns conservative magazine brand Washington Examiner and daily newspaper Colorado Springs Gazette. Also in local news, Charlotte, North Carolina-based newspaper group The Pilot has acquired monthly SouthPark Magazine from The Charlotte Observer Publishing Company. The Pilot, based in Southern Pines, also owns five other regional titles, including PineStraw in the Sandhills, O.Henry and Seasons in Greensboro, Salt in Wilmington and Business North Carolina in Charlotte. SouthPark's staff will move into Business North Carolina's offices in downtown Charlotte. The Charlotte Observer Publishing Company is owned by McClatchy, one of the biggest newspaper publishers in the U.S.
SouthPark Magazine distributes over 30,000 copies monthly in Charlotte's SouthPark, Myers Park, Eastover, Dilworth, Cotswold and Elizabeth neighborhoods. It will focus on covering the arts broadly, from “architecture and interior design to the performance arts and literature to bartending and beer making,” according to a statement. Separately, Tribune Publishing has announced the top editor of the Virginian-Pilot and Daily Press is leaving amid a restructuring. Marisa Porto has served as both editor and publisher of the Daily Press since 2016, and editor of the Virginian-Pilot since Tribune bought the Pilot in 2018. Tribune executive Par Ridder told staff last week that the company would no longer have a single role for both editor and publisher, according to the Pilot. The title of publisher has been eliminated and the business side will be overseen by a general manager. A search is underway for a new editor and general manager.